Headliner Miles Hunt performed at The Courthouse on Saturday, which had people off their seats and dancing before the end of the show. 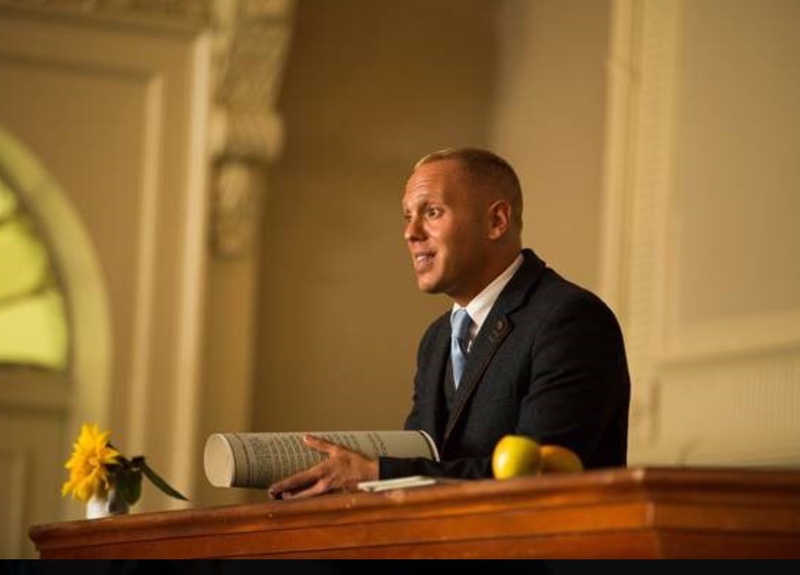 The 200-year-old former crown court was a new venue for the festival, having recently been transformed into a restaurant, hotel and community function space. Meanwhile, Mark Radcliffe hosted three folk nights and performed himself at Knutsford’s Little Theatre to packed crowds. The Radio 2 and 6 Music DJ usually presents the BBC’s Glastonbury coverage during the festival, but was able to lend his support due to Glastonbury’s ‘fallow year’. Also new for 2018 was family-friendly music activities on The Moor, including an eclectic range of acoustic performances, drumming workshops and a singalong with Elsa from Disney’s Frozen, which was well attended in the sunshine. Sarah Morgan, Deputy Town Clerk for Knutsford Town Council, led the event’s organisation. She said: “Knutsford Music Festival exceeded our expectations and showed what can be achieved when a community pulls together. “We’re a small team and the event is only possible thanks to the hard work and enthusiasm of everyone involved. “Mark Radcliffe’s support and celebrity kudos was hugely appreciated and the folk nights were a huge highlight. The standard of the musicianship was incredible. “But I also can’t thank the town council team and councillors involved, performers, Knutsford Hosts, venue staff and volunteers enough. “As a mum, I thought the music on The Moor was a great addition and focal point for families too. 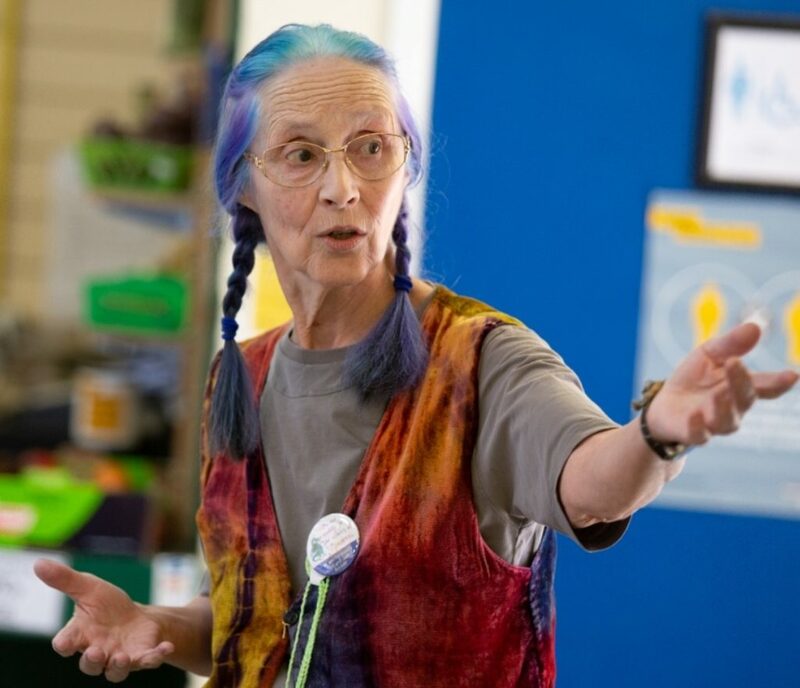 “And the wider community took the event to heart with a number of ‘fringe’ events. Cllr James Power, a member of the music festival working group, played a jam session in Dexter and Jones. He said: “There was something for everyone – from drumming workshops to blues, folk and classical sounds. 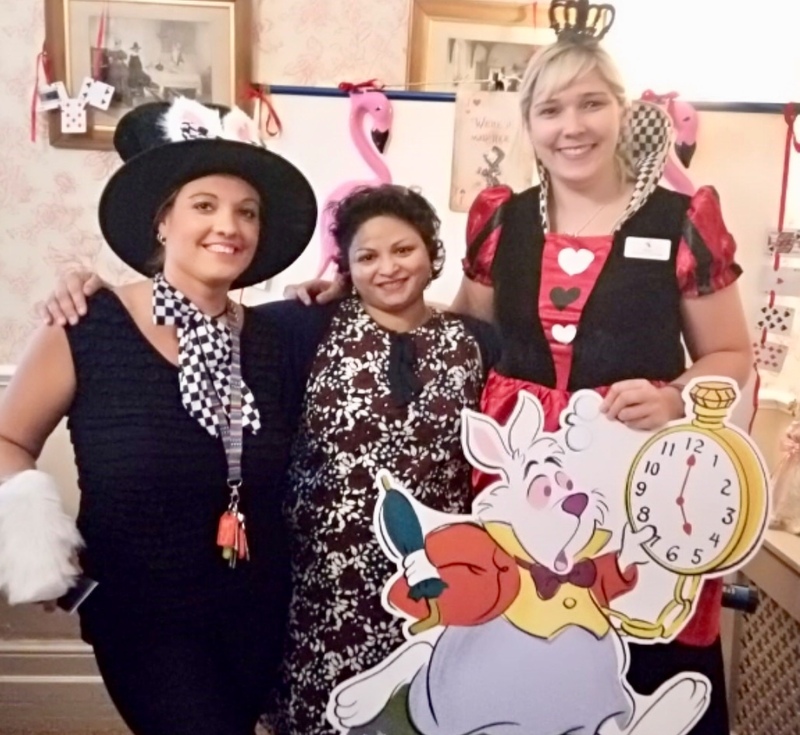 “Knutsford showed its charm and its easy-going welcome to everyone. KNUTSFORD Beer festival organisers are raising their glasses to the ‘astounding’ success of this year’s event. More than 1,600 pints were drunk by the 600 beer enthusiasts who attended the three sessions at Egerton Youth Club, raising money for charity in the process. “The festival proved to be an astounding success with more visitors, more beer sold and more money raised,” said festival organiser Andrew Malloy. 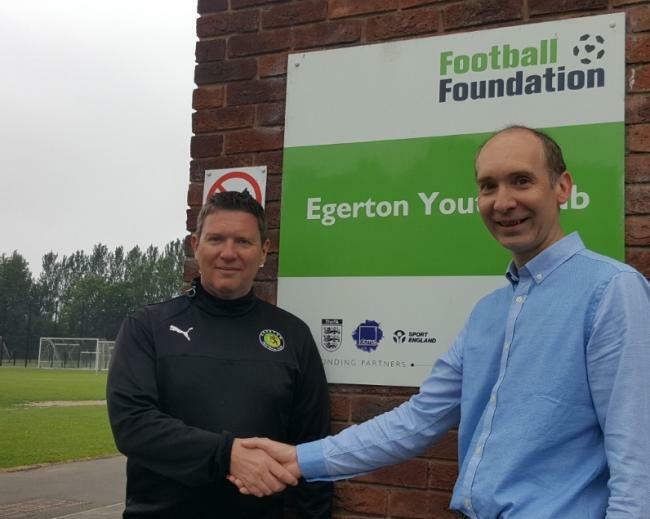 “The event generated funds for the two main charities – Egerton Youth Club, and Knutsford District Scouts, with a further donation to be made to Knutsford and District Royal British Legion. “The 2018 Beer Festival opened with a VIP event on April 19 as a way to thank our sponsors, as the event could have not taken place without the generous support of our sponsors, Bella Marketing, APC, Tatton Brewery, Event Buddha and 48 local business cask sponsors. “The beer enthusiasts consumed a fantastic array of real ales from across the north west and beyond, with the winning beer being Titanic’s Plum Porter. “Dexter and Jones provided artisan gins and Rebecca and Vanessa from The Box prosecco, wine and an authentic Mystique rum punch to add a touch of glamour. “There was also great food from Spicy Jacks, the Curry Den and Knutsford-based The Market Café. “Knutsford’s Fines Lines entertained the sponsors on Thursday evening, and Bad Dukes and Beggars’ ska-based covers got the party started on Friday evening. “The event culminated in a foot-tapping show from the award- winning Merry Hell. “We are delighted to announce that donations will be made to each of our nominated charities, with Egerton youth Club and Knutsford District Scouts each receiving cheques for £1,500, and a donation of £500 will be made to Knutsford and District Royal British Legion, as special recognition of the sacrifice made by many Knutsford residents 100 years ago this year. 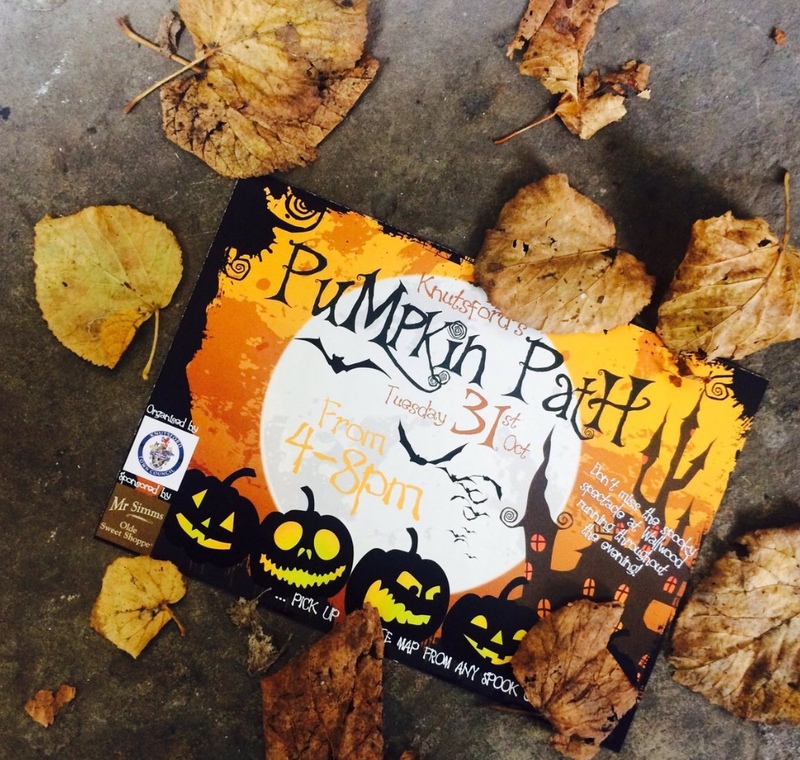 Staff at The Alchemist will be on hand to support the town’s popular Pumpkin Path event as part of the Knutsford Hosts – a scheme which sees residents volunteer their time to ensure events run smoothly. 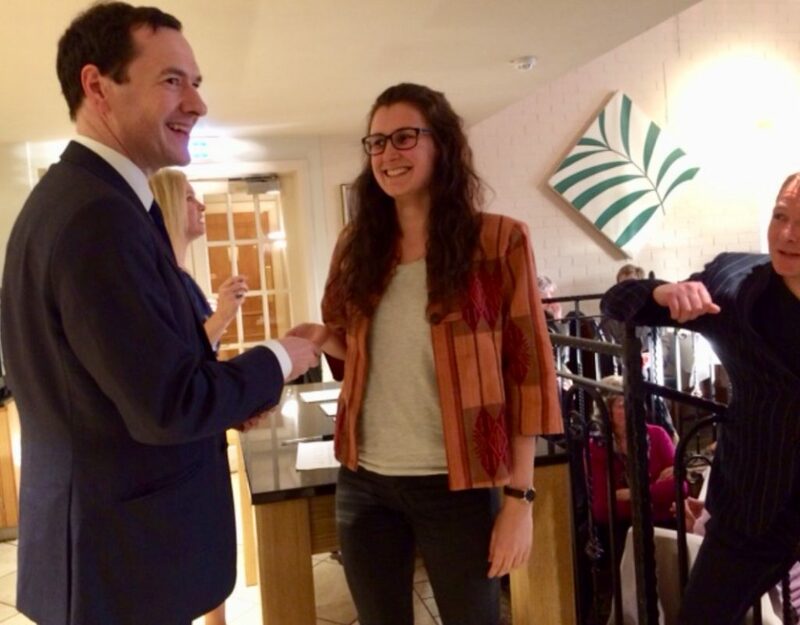 With individual Hosts including former Tatton MP George Osborne, The Alchemist in King Street has signed up as a business to help out. 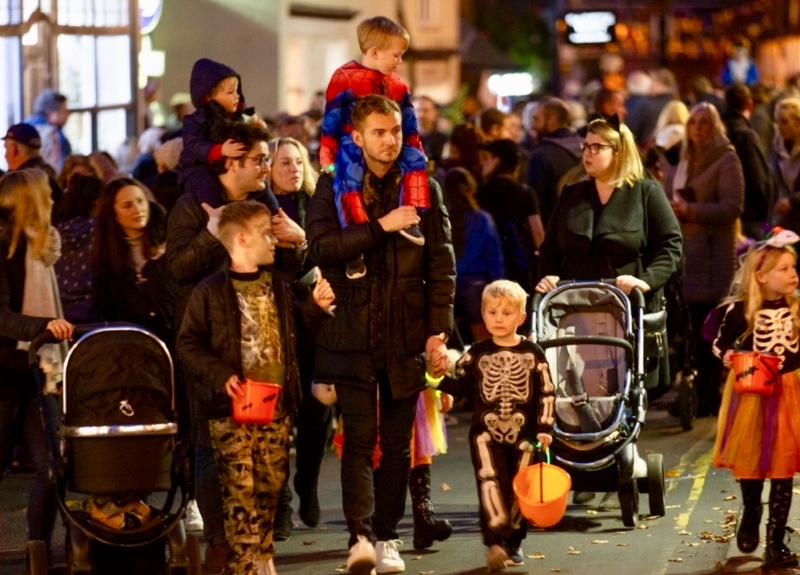 The Pumpkin Path has quickly become one of the town’s favourite seasonal events, with businesses welcoming children to complete a Halloween-themed challenge. 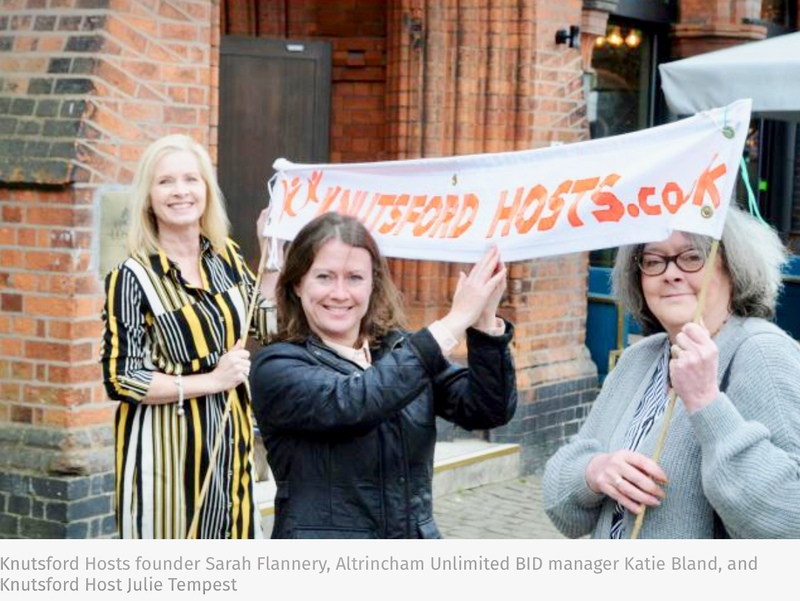 Sarah Flannery, founder of Knutsford Hosts, said: “The Alchemist, part of Living Ventures, is the first business to join the Hosts. 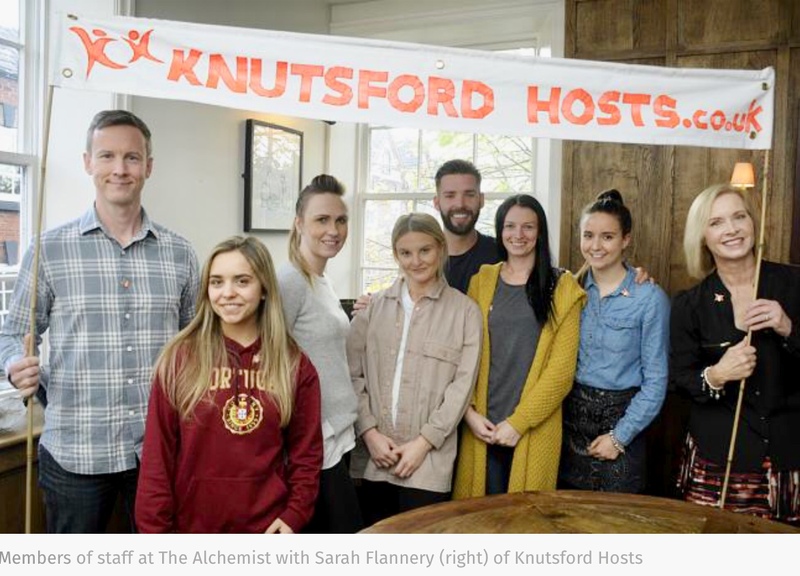 As part of their corporate social responsibility, The Alchemist runs a scheme called Currency of Kindness so that staff can volunteer in paid time. “Joining the Knutsford Hosts is a win-win for both organisations. Through the Hosts, The Alchemist will be able to help promote the whole town and its many events and organisations. The Hosts scheme has proved popular, with almost 100 members in the Knutsford group. Knutsford will be ready to welcome residents and visitors alike to its annual Pumpkin Path trail on 31st October from 4pm to 8pm. This year sees Knutsford Town Council organising the event with sponsorship kindly provided by Mr Simms. As per previous years the event will see youngsters and their parents scouring King Street’s shops and restaurants to find the eleven carved pumpkins which spell out “PUMPKIN PATH” before submitting their entries to the Heritage Centre’s spooky post box. A huge number of local traders will join in the fun to make Knutsford a truly special and spooky place to visit. The trail will finish at Wallwood at the Tatton Street end of King Street. Wallwood will be decorated by Events2Scare in true Halloween style involving witches and wizards, lighting and music. In addition, Booths supermarket’s Knutsford branch will be kindly donating their extra-large pumpkin. Visiting spooks can have their photo taken alongside it and send to Twitter with the #PumpkinPath. As well as the shops kindly hosting pumpkins (donated by Knutsford’s Little Waitrose) the whole of the community has got involved. A huge variety of retailers will be decorating their windows, Pizza Express, Oxfam, Fine & Country, Boots, Zo & Co to name but a few. The window competition entries will be posted on Facebook and Twitter for the public to vote for their favourites and the winner will be announced the following week by the Mayor. Local company Event Buddha are providing traffic management services and volunteer groups Knutsford and Districts Lions and Knutsford Hosts are assisting with marshalling duties. Gusto will be kindly providing hot drinks for all volunteers on the night. Sandra Curties, town centre manager, said: “We have been overwhelmed with the support from local organisations and retailers. Both large and the smaller retailers are supporting this event. It seems the whole community is coming together to ensure Knutsford’s Pumpkin Path becomes the go-to Halloween event in Cheshire”.